"Trinity War" - Chapter Three: "House of Cards"
Immortal mystic Madame Xanadu finds herself at the mercy of the mastermind orchestrating the events of the Trinity War. Her abilities to see the future would toss a hefty wrench in the villain's nefarious plot. Whatever the nature of that plot, the mastermind assures, all the pieces are in place, and there's none who can stop it. At ARGUS Headquarters, under the command of Amanda Waller, Firestorm goes about the chore of replicating kryptonite. Superman is being contained, the apparent killer of Dr. Light, and it isn't certain how long the most powerful being on the planet can be shackled up. Kryptonite is Waller's disaster prevention plan. Elsewhere in the headquarters, as members of the JL and the JLA, with Zatanna, oversee Dr. Light's scorched body, the Phantom Stranger informs the teams that Wonder Woman has gone in search of the JLD in the hopes that that dark group of paranormal misfits can help her find Pandora. In New York at the stoop of the House of Mystery, Diana confronts the JLD. John Constantine, the team's leader and Scouser mouthpiece, is interested in neither helping Diana nor finding Pandora. He's more concerned with the whereabouts of Xanadu. It's too late now, though. Everything is on the way to hell in a great big creepy hand basket. The Leagues are deteriorating, becoming fractured by infighting, suspicion, and self-interest. By now Superman, with the help of the Question, knows he isn't to blame for Dr. Light's death. It looks like Dr. Psycho may have played a hand in this house of cards. Further fragmentation causes Waller to lose grip of her agents. There are mysteries to solve and a world to save, and Waller's brazen political posturing isn't helping. Even if Waller was of use, it would seem to be of little help: information of the League's plans is trickling to the shadowy devil holding Xanadu captive - via a mole in the Justice League! Story - 3: Honestly, I've been finding Trinity War a pretty normal affair so far. The magical and supernatural core of the story is the linchpin, keeping the wheel spinning when it would otherwise whirl right off of its axis. I admit to some bias there: I love paranormal stories; ghosts, magic, immortals, incantations, demons, shapeshifters, ancient artifacts of wizardry, the whole shot. Sign me up. 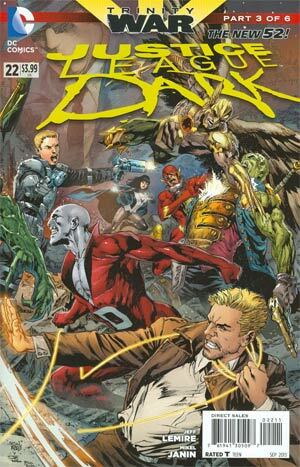 DC is a leader in the mainstream industry with these kinds of characters and tales, and the finest titles - or at least my favorites - of the New 52 fall under the "dark" category. 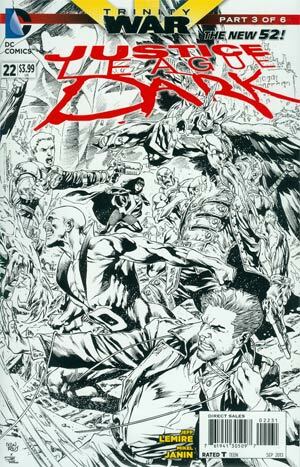 Few other titles in industry-owned comic books today are as well crafted as the paranormal titles by DC. Paul Cornell's run on Demon Knights, Jeff Lemire's current runs on Animal Man, Justice League Dark and Constantine, and Scott Snyder's, now Charles Soule's Swamp Thing are DC's shining examples of what makes comic books so compelling. And so I'm very interested in how this whole crisis unfolds. Unfortunately, the Trinity War is so huge it's teetering on the edge of convolution. Spanning three titles and now a few tie-ins, it's much larger than the events of Rotworld, although it doesn't yet feel as urgent or as dangerous. Rotworld had serious consequences for the entire planet, and potentially the galaxy, and it felt that way from the start. Trinity War wants to be epic, but so far it's popping the stitching on its breeches. While Geoff Johns is the architect of this story, which seems it's on its way to being less like the punk rock of the Sinestro Corp War and more like the adult contemporary of New Krypton, this issue is held down by the exceptionally competent pen of Lemire. Lemire knows his characters. He knows them so well that I would bet he's fluent in their daily dealings, the little things that don't matter to the plot and never get revealed to the reader, but still swish inside of Lemire's head. It matters that a writer know his characters better than the reader, because then the writer can unravel before us with care and dedication characterizations that are genuine and fervent. When you create, I believe, create fully. This is where Lemire shines, and outshines Johns. 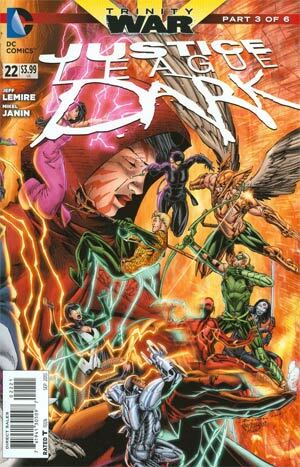 And this is where JLD #22 is so far easily the best installment of Trinity War. There are some bumps that could have been smoothed out. The framing of events jerks around a bit as Lemire seems to want to tell as much as he can in this issue. The characters are given that aforementioned Lemire-care, but they're blasted through the story, bouncing off of sharp panel-turns along the way. I have to complain: there's too much left for tie-ins here. If you want to know what happens to Shazam, you'll need to pick up Constantine #5. And the search for Dr. Light's soul? We won't be privy to any of that unless we pick up Phantom Stranger #11. Both of those seem like fairly important events. Shazam and Dr. Light both have integral roles early on, and so it would only fall to reason that we need to know what goes on. Yet, we're being forced to branch off into tie-in territory. There were a lot of tie-ins for Batman: Death of the Family, and yet we didn't need to follow any of them to keep pace with the main plot. The same goes for Rotworld. That was a huge story, yet we didn't need tie-ins. There's no need to break up the story - or our wallets - for what the publisher wants to be epic. We can look on the bright side, I suppose: at least this isn't Marvel. Art - 4: There's not much to complain about here. Janin's art is sleek, and he rarely misses the mark. I particularly like how he draws Superman. He's an old hand now with the JLD and he seems to know and love the characters as much as Lemire does. Cover Art - 2: Your regular, garden variety mash-up smash-up cover. It's boring.